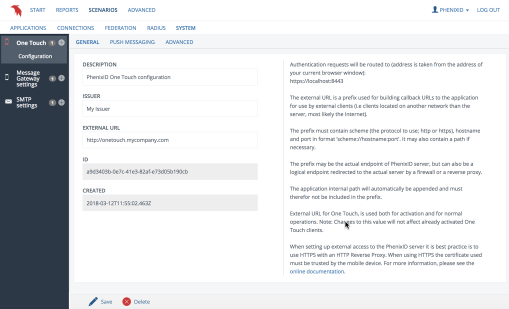 The One Touch guide configures the PhenixID server backend components enabling the use of the One Touch client. When configured, the One Touch extensions in MFA Admin and Self Service will be enabled. 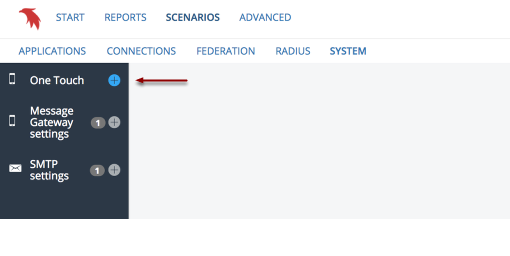 Start the guide by clicking the '+' sign on the One Touch menu item. Issuer is a logical name used for naming profiles the One Touch application. External URL is a prefix used for building callback URLs for use by the One Touch client to enroll and to fetch assignments. 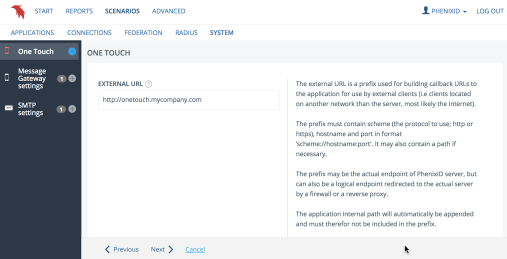 The prefix may be the actual endpoint of PhenixID server, but can also be a logical endpoint redirected to the actual server by a firewall or a reverse proxy. Using a firewall or reverse proxy for the traffic is strongly recommended. Choose the URL with care since this value can not be changed for activated clients. The URL needs to be accessible from the devices using One Touch, SSL should be used. Enable support for sending push notifications to mobile devices. Used for notifying users of pending assignments. 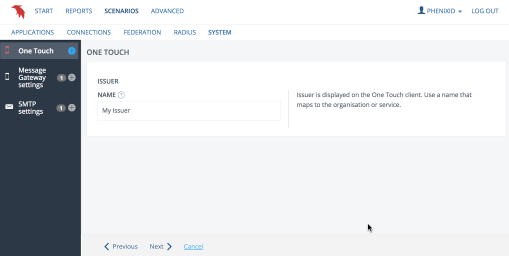 Guide is completed, click Create create the One Touch configuration. Server will immediately activate the One Touch backend components. When editing a guide configuration you click save to save your changes. Save applies to all tabs. Server will immediately reload to reflect your changes. If you click delete the configuration will be deleted. 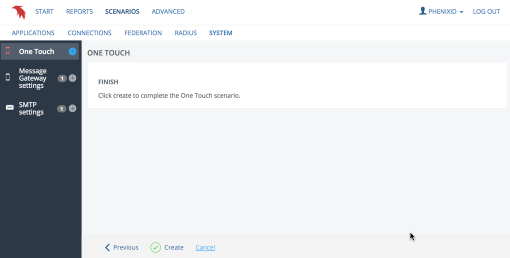 Please note that other configurations using One Touch will break if you delete your configuration. General settings. Please note that Issuer and External URL settings will not affect already enrolled/activated clients. For more information about External URL, see Server External URL. Enable component specific HTTP listener. If using SSL/TLS the server certificate must be trusted by the One Touch client.